ATTENTION: Float 2.0 air cylinder must be purchased separately. The Float 27 Speed™ avalanche airbag is designed for close-in backcountry riding and features the new Float 2.0 system. Creating buoyancy and helping you float to the surface, the 150-liter airbag not only decreases your burial depth but also protects your head and neck from trauma in an avalanche. Nearly 30 percent smaller and 15 percent lighter than our Float 1.0 engine, the Float 2.0 engine fits inside the Float airbag compartment, freeing up more valuable space in the main compartment. All BCA Float packs include integration for BC Link™ Radios, hydration sleeve, dual zippered shoulder straps, and molded back panel. 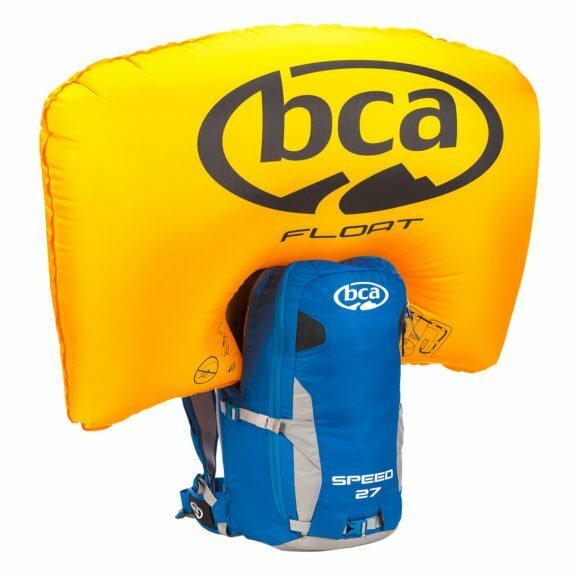 BCA’s 200+ authorized refill locations around the world make it the easiest refillable airbag system on the market. Float 2.0 air cylinder must be purchased separately. The Float avalanche airbag system does not guarantee survival in an avalanche incident. Educate yourself, make good decisions, and know before you go!